Built in 1889, the Fred W. Kienhoff barn is located near Wathena. The barn is a one-story, three-bay, center entrance building that is vertically planked and has a partial byre with a limestone foundation. While the barn was originally used for draft animals, it is now used for hay storage. 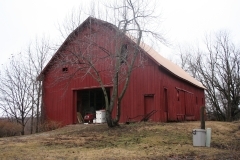 This barn was nominated as one of the 18 Byre and Bluff barns of Doniphan County. A common feature of these barns is that at least one side of each barn’s foundation is embedded in an earthen bank or bluff. These barns are an example of vernacular architecture built to take advantage of the hilly topography of the county and are significant for their relative rarity and architecture. The George Kinkead Barn was built ca. 1917 near Troy. This three-bay barn is one story, has center and side entrances, and is clad with board-and-battens. It also features a gambrel roof with a full loft and full byre with a brick foundation. Originally, the building was a mixed-use barn. 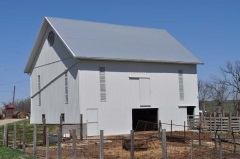 It was nominated as one of the 18 Byre and Bluff barns of Doniphan County. A common feature of these barns is that at least one side of each barn's foundation is embedded in an earthen bank or bluff. These barns are an example of vernacular architecture built to take advantage of the hilly topography of the county and are significant for their relative rarity and architecture. Elwood's Lincoln School was the last building in Doniphan County to be used for racially segregated education. The school replaced McKinley School, which burned in 1934, and served African American students in the Elwood area from 1935 to 1955, when it closed as a result of the Brown v. Topeka Board of Education U.S. Supreme Court decision in 1954 that outlawed racially segregated educational facilities. 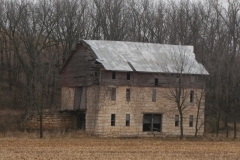 The building is one of the community's few older buildings, as this area is prone to major floods associated with the nearby Missouri River. In the years after its closure, it served as a community building and library. 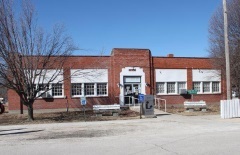 It was nominated as part of the "Historic Public Schools of Kansas" multiple property nomination for its local significance in the areas of education and African American heritage. Abram M. Minier, a grandson of John Bayless, a founder of Highland, commissioned the construction of this Craftsman bungalow in 1916. 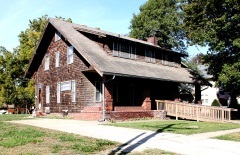 Though the builder of the house is not known, it was built from a house plan by Gustav Stickley first published in the November 1909 issue of "The Craftsman" and later published as Cottage No. 78 in Stickley's 1912 catalogue "More Craftsman Homes." The catalogue estimated the construction of the house to be $5,000. There were some minor modifications between the published plans and the blueprints for this house. For example, the fireplace was constructed as brick rather than stone, and the interior plan was modified slightly to incorporate a small, screened porch on the rear elevation. The home otherwise contains all the signature Stickley designs including wood shingle siding, exposed rafter tails, a full-width front porch, heavy structural beams, built-in bookcases and seating, and Mission-style hardware. 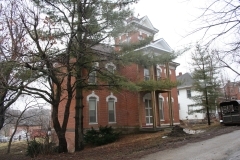 The Minier House was nominated as part of the "Historic Resources of Highland" multiple property nomination for its local significance in the area of architecture. The Godfrey Nuzum Barn, built ca. 1870, is located in Sparks. The barn features a gable-end entrance, wood lap siding, and a full byre and limestone foundation. The building was built as a mixed-use barn. 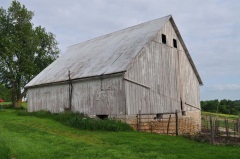 This barn was nominated as one of the 18 Byre and Bluff barns of Doniphan County. A common feature of these barns is that at least one side of each barn's foundation is embedded in an earthen bank or bluff. These barns are an example of vernacular architecture build to take advantage of the hilly topography of the county and are significant for their relative rarity and architecture. The Poulet House was built ca. 1878 for Alex Poulet, a French native who became a prominent businessman in White Cloud. The three-story, red brick house has a rectangular plan and features a square tower over the main entrance. There is an arched stone lintel over each window and door opening. The roof of the house is hipped, with four gables on the tower. The rear side of the house has a balcony. The Poulet house is an excellent example of early residential architecture reflective of the Italian Renaissance style. The William Ritenour Barn was built ca. 1875 and is located near Leona. It features three bays, a central entrance, vertical wood siding, and a full byre and limestone foundation. The barn was originally constructed as a draft animal barn. 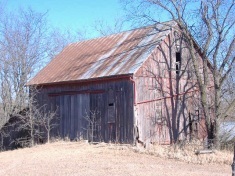 Although only listed in the state register, it was documented as one of the 18 Byre and Bluff barns of Doniphan County. A common feature of these barns is that at least one side of each barn's foundation is embedded in an earthen bank or bluff. These barns are an example of vernacular architecture build to take advantage of the hilly topography of the county and are significant for their relative rarity and architecture. 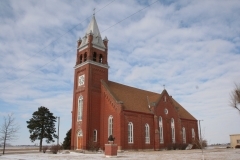 The St. Benedicts Church, built in 1903, is located five miles southwest of Bendena. It was built upon the same limestone block foundation of the 1895 church that was destroyed by a tornado. The building features a red brick exterior, a front-facing gable, and a tall bell tower containing the arched doorway into the church. Each elevation contains six stained glass windows separated by false buttresses. St. Benedicts Church is an excellent example of the High Victorian Gothic style with Romanesque Revival-style influences. St. Martha's AME Church was built in 1882 in Highland. 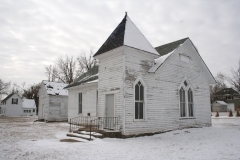 The one-story church features a rectangular plan, a gable roof, clapboard siding, and a side steeple. The north side of the building contains gothic inspired windows with triangular lintels. A parsonage was located south of the church, and featured one-and-a half stories, a gable roof, and clapboard siding. The church shows significance through its vernacular expression of the Gothic Revival style. When listed in 2000, the Parsonage was included as a contributing resource. Due to its deteriorated condition, the Parsonage was demolished in 2015.